Jatropha has been rebranded in Zimbabwe as ‘green gold’ in the energy sector. The rebrand comes just after a Government initiated plantation Jatropha Out-grower Scheme failed due to lack of resources and policy direction. Farmers formerly contracted in the outgrower scheme were abandoned and the parastatal which spearheaded the project was dissolved. Now there is a coalition by the Government and two environmental and conservation NGOs trying to repack jatropha for sustainable rural livelihoods. These scenarios are assessed by political ecology lens to reveal the politics embedded in the failure of the jatropha outgrower scheme and the current projects by the Ministry of Energy and Power development, WWF Zimbabwe and Environment Africa. 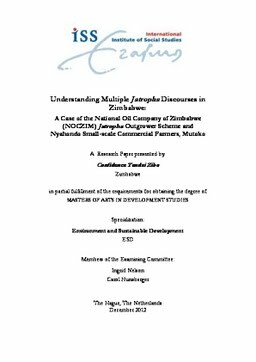 Relevance to Development Studies This research is relevant to development studies because it addresses the politics surrounding the jatropha discourse in Zimbabwe. Considering that jatropha projects have footprints of the land available for food, this is relevant in development studies.